Whether it's those pesky grey hairs or you desire a whole new look, our all over service has you covered. *Short Hair is above the shoulder, **Long Hair below. Additional fee for lengths below mid back. "I want my hair red. Not light red, but not too dark a red. But I wanna see the red...."
Hair color is very personal. We're confident we can match your vision with our expertise. Our full line of Artego colors have everything from pale blondes to blue blacks. 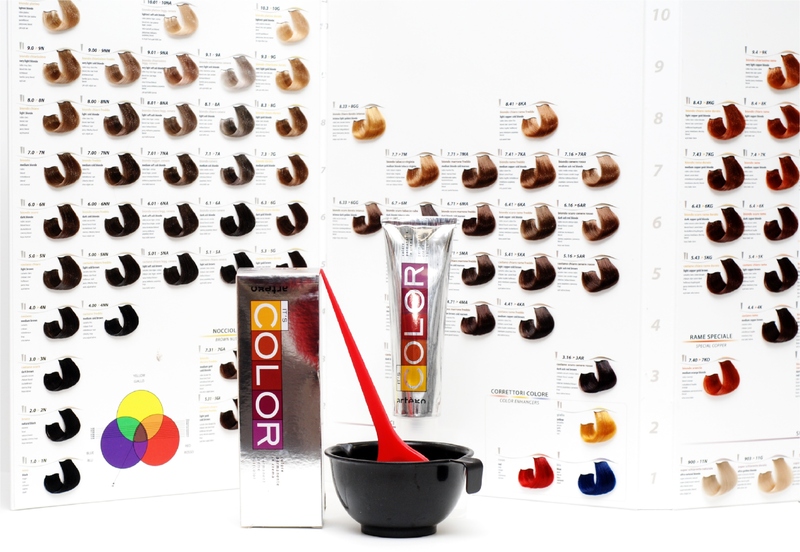 With ammonia free color gels, gentle permanent cream hair colors and bleaches, The Look has it all. This method isolates selected strands of hair with color in folds of foil. Highlight, low light, or both to achieve a customized color effect. A 12 Pac is often concentrated around the face for a 'touch of sun' look or the nape for a 'peek-a-boo' of color. A Partial Foil covers the area on the crown from ear to ear, and a Full Foil is the entire scalp. Foiling is a great way to experience a subtle color boost, create dazzling contrast, and for the adventurous- shocking special effects. Tone on Tone colors offer the best of both worlds. All-over color with high or low lights in one great service. Prices available with free consultation. Hair Extension information is available on the 'Brows and More' page.